Each day, as we get ready to play our part in society, we put on our favorite fragrances and cosmetics and unknowingly subject ourselves to toxic chemicals. Over time, these toxic chemicals can cause cancers, tumors, bronchial issues and other health related problems. Rather than allowing chemicals and toxins to absorb into the skin, learn about the natural alternatives that are out there. Mineral salts with active ingredients, such as ammonium or potassium alum work by constricting the protein in sweat so that bacteria have less to feed on. Clay minerals, such as bentonite, and natural powders like cornstarch or arrowroot help absorb moisture. Essential oils working in conjunction with natural astringents (witch hazel, alcohol, etc.) have also been shown to help evaporate moisture on the skin and constrict pores. Another alternative is to make your own deodorant. Further, using a warm washcloth and scrubbing your arm pits will help to remove any bacteria and help open up the pores so they begin functioning again. While doing this, you can add a drop or two of essential oils such as tea tree oil, to help cleanse the area more thoroughly. 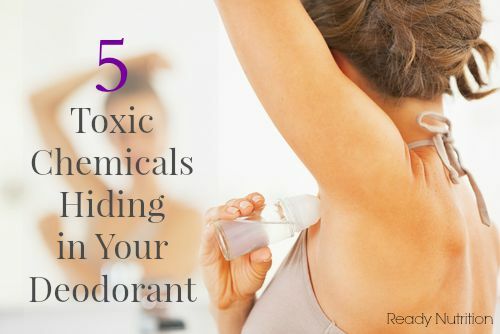 As you can see, there are alternatives to chemical-laden deodorants. It is important to inform yourself on the risks of these over-the-counter antiperspirants and begin considering the alternatives. They are more natural, cheaper, less harmful and will keep your body functioning rather than backing it up. If you eat a balanced and healthy diet you should not need deodorant. NO?.